My Sunday consisted of no makeup, enjoying the nice weather & walking to breakfast (yes, without makeup. ), a lot of arrested development in preparation for the new season (woohoo!! ), talks on the porch, a little yoga, and giggles in the kitchen. I'm always grateful for simplicity. 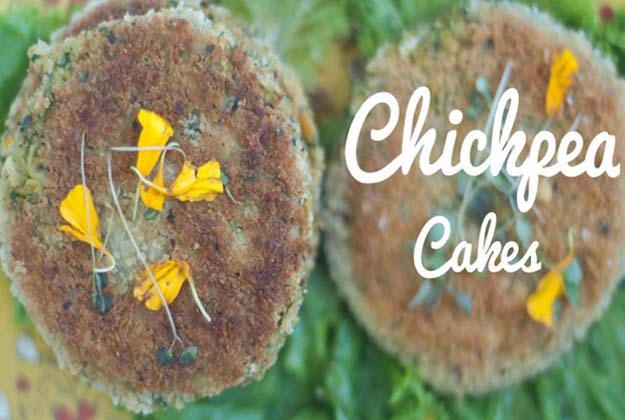 For dinner I made these chickpea cakes based from this recipe. We ate these up and licked the plate! You can't go wrong when you batter and pan-fry your meal in panko. 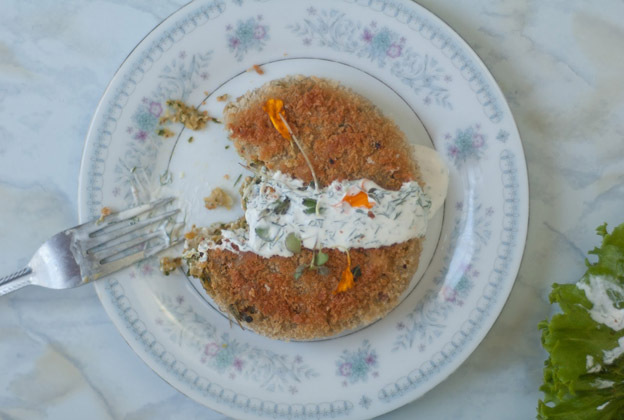 These patties are vegan but obviously, the crème fraîche is not. 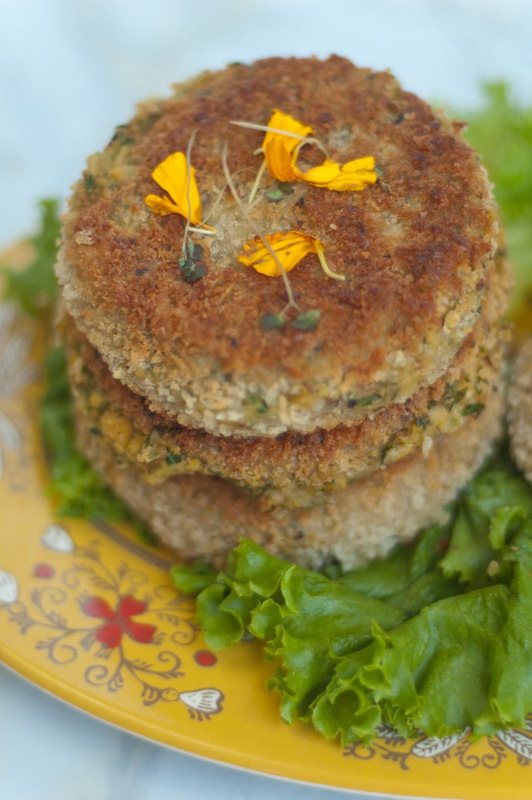 The creamy lemon dill flavors complimented these patties so well. Without the sauce, the patties could be borderline bland without some extra seasonings or topping of some kind. So if you would like to keep it vegan, try some sauteed shallots, or avocado and lime from the original recipe, or a spicy herb sauce. This recipe is a great base recipe open for interpretation and I'm excited to experiment with it next time. It's a definite keeper! 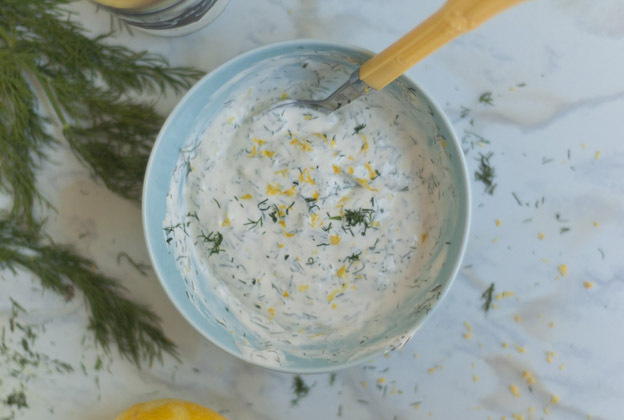 To make the crème fraîche- mix 1/2 cup crème fraîche 2 tbsp chopped fresh dill, 1/4 tsp sea salt, 1/2 tsp fresh lemon juice, and zest of one lemon. Refrigerate for about an hour so the flavors can mix and marinate. In a food processor, combine green onions, parsley, cilantro, garlic, serrano, and coriander. Add half of the chickpeas and pulse until a rough puree forms. Transfer to a large bowl. 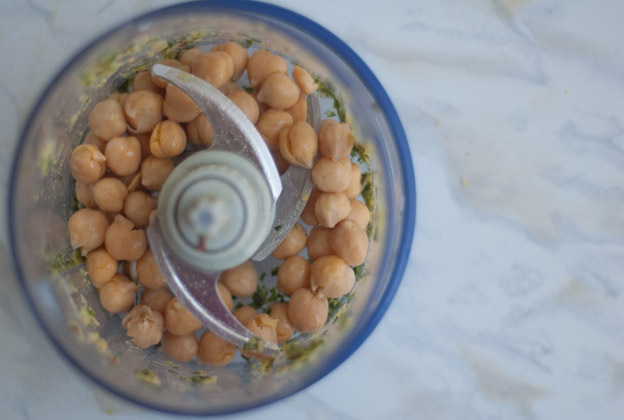 Add remaining chickpeas to the food processor and pulse until they are roughly chopped. combine with herb chickpea mixture in large bowl and stir in the flaxseed. Season with salt and pepper. Form into patties. I made 4 large patties. Refrigerate for 30 minutes. Combine flour and water in a shallow bowl. Place panko in a separate shallow bowl. Heat skillet with 2 tbsp canola oil on medium-high heat. Dip each patty in the flour mixture, then in the panko crumbs. Careful not to overcrowd your pan, cook each patty for about 2-4 minutes on each side, until golden brown. Top with micro greens & dill crème fraîche.